The transition from a conventional life to full-time RVing can have its ups and downs, however, and there are some pitfalls to avoid and things to consider as you go through the planning process. Just for starters, what kind of RV is best for living and traveling in? This is the second article in our three-part series on full-time RVing and it explores some of the issues involved in getting from here to there. The other two articles are: Working and Living in an RV and Full-time RVing Tips – Mail, Domicile, Insurance, Saving $$? How Do Full-time RVers Travel? Which RV Makes the Best Full-time Rig? HOW DO “FULL-TIME” RVers TRAVEL? Full-time RVing includes a wide range of lifestyles, from folks who travel a lot to folks who stay home. 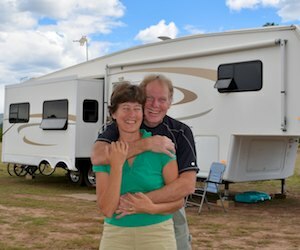 Many “full-time” RVers are technically “part-timers,” living in their rig for a few months a year and maintaining a home somewhere. This is a great way to go if you can afford to have both a house and an RV, especially if you can leave your home under the watchful eye of a friend. For most of these RVers, the travel routes are pretty much north/south. After spending the first months of our first winter in southern Arizona, meeting people from Idaho and Montana, we were amused to go to South Padre Island Texas and discover many of the RVers were from Wisconsin and Minnesota. Everyone we’ve met in Florida seems to be from Michigan or the Northeast! As a side note, if you are looking to simplify your life as well as travel, splitting your time between two homes like this can be a little complicated, as you have either a house or an RV that is always vacant and will need some TLC when you leave it and return to it. There’s nothing like hitting the open road! A lot of full-timers don’t actually travel 12 months a year. 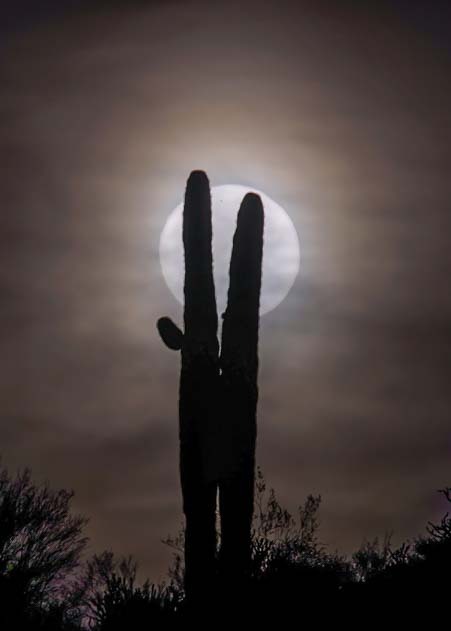 Some rent or own a site in an RV park somewhere for part of the year, using this location as a home base and roaming around as the spirit moves them. Seasonal RV park rates are reasonable, and some parks include a storage area for boats and ATVs or even an alternate RV like a “weekending” or “summer travel” truck camper. Some of these parks also allow you to spread out to do repairs on the RV and clean it up after a season of travel. 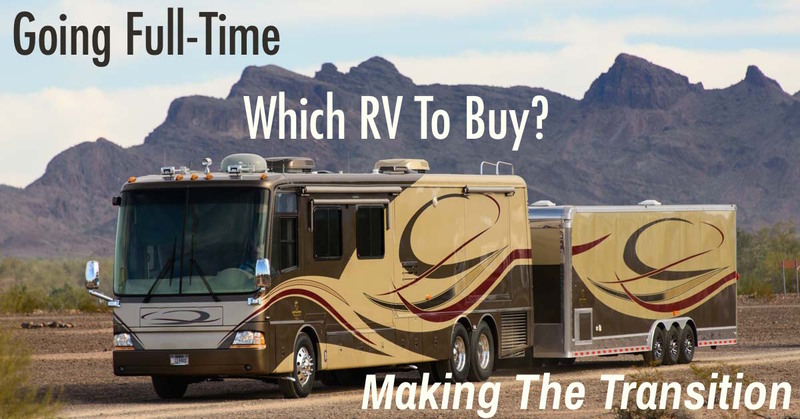 Some full-timers split their time between two RV parks where they have sites they rent or own. Many RVers work camp in a northern location in the summer and in a southern location in the winter. These types of full-timers have a strong sense of home and community because they return to the same places year after year. Many full-time RVers wander all over the place, more or less in perpetual motion. Some camp in state parks and forest campgrounds or boondock most of the time, and others stick to RV parks which have more amenities. Some belong to campground membership programs, giving them a primary resource for finding places to stay, and also giving them a rich social life as they make friendships within the programs and plan their stays to coincide with their friends’ stays. 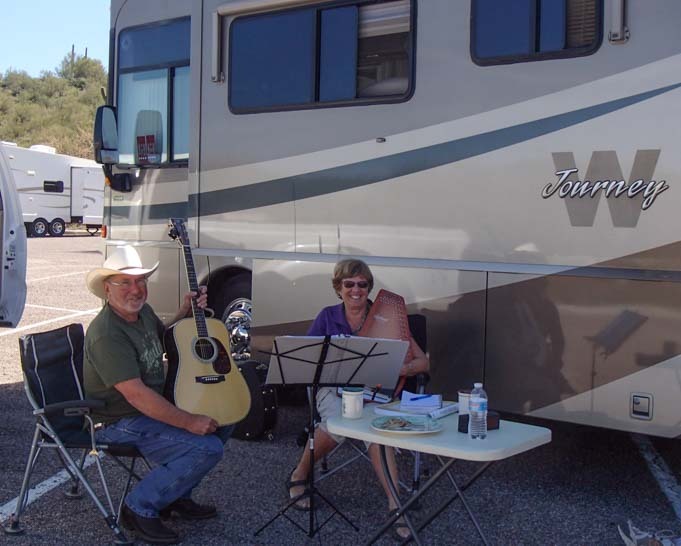 Some full-time RVers stay in one park year-round. A few of these folks are retirees who no longer wish to travel but want to remain in their RV. Others are younger working people that have a full-time job in the area that keeps them rooted in one spot. Starting a full-time RV lifestyle is an absolute thrill. Leaving the bonds of a conventional life to live in total freedom made both of us feel vibrantly alive. Years ago I wrote a blog post about why we decided to go full-time, called Why Do It? I outlined the many reasons we decided to leave our old lives behind and try a life of adventure on the road. Going full-time sounds great, but there can also be some bumps in the road on the way to your dream RV lifestyle, and that’s to be expected. The whole process may go swimmingly and you may live happily ever after. But more than likely you will experience some heartache on the way. We did. It’s part of what happens when you deal with important things like Lifelong Dreams, Personal Growth, Enrichment and Fulfillment. The downsizing process can be intense, especially if you are emptying a large house that you have lived in for years. Keeping your dream alive and priorities straight during this (sometimes) stressful time is really important. When we downsized a second time as we moved off of our boat and back into our RV, I wrote a post On the Road to Your Dreams, Stay the Course to help me keep the big picture in mind. For a lot of people, downsizing all the way into an RV is a really liberating experience. After the hard part of sorting through everything, there is an uplifting sense of relief and unburdening that happens when you let most of it go. Many people begin full-timing at the start of retirement. This means they are going through two major life transitions at once. Simply changing from the workaday life to one of an agenda-free retirement is a shock to the system. Downsizing into an RV and moving away from old friends and life structures at the same time can become a little overwhelming. Retiring early is a super idea, but there is no badge of honor for going full-time. In some cases it might make sense to enjoy retirement for a little while first. Going on some shorter duration RV travels before you jump ship all together might accomplish the same travel and freedom goals without giving up the security of everything you know right away. At the same time as all of this, you are dealing with your life partner in a whole new way. You are together much more than you used to be and are suddenly dependent on each other in ways you’ve never been before. Learning how to operate the systems in the RV, navigating unfamiliar roads in a hugely oversized vehicle in traffic, and getting in and out of RV sites with an audience watching can put a lot of stress on a relationship. To diffuse the tension a little, revel in acquiring new skills, whether it’s learning to read a map or learning to take directions from your spouse as you drive. Respect and patience go a long way as you both adjust to new daily patterns, and in the darkest hours, remembering why you fell in love in the first place always helps. Any scratches that appear on the RV as a result of your joint learning curve can always be repaired! 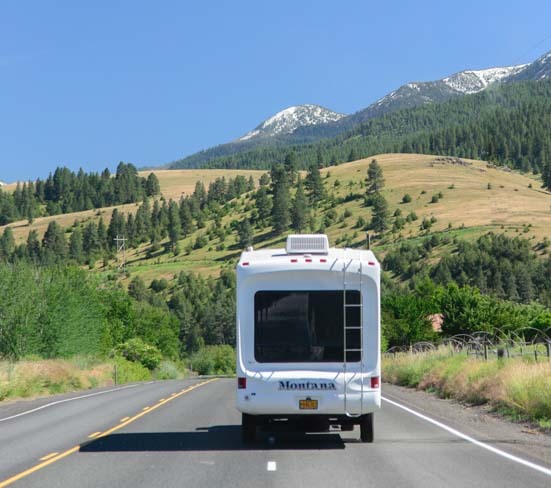 There is a huge build-up to the Day of Retirement, and even if you are 30-something and are starting full-timing, there is an even bigger build-up to the Day of Driving off to a New Life in an RV. Some kind of let-down is only natural. There is also the shock of reality. The RV life depicted in blogs (including this one), books and magazines (including articles I’ve written) may not reveal some of the more mundane and even yucky aspects of life on the road. For us, this lifestyle is almost entirely one of wine and roses, but roses do have thorns and you have to learn to deal with them. You may be ecstatic when you cast off in your new life, and you may be Living The Dream right from the get go. But if not, don’t panic. There’s an adjustment phase and a learning curve that most new full-timers go through. It takes time to figure out your travel style and what works best for you. It’s really common for new full-timers to drive thousands of miles to dozens of destinations at a breakneck pace the first year. We sure did. Heck, you’re excited! You’re free! You run around like crazy! And then you drop from exhaustion. Learning to slow down and to alternate the sightseeing days with the chore days takes time. Allowing yourself to have a few down days of doing nothing so you can absorb all the thrills you just had during some exciting sightseeing days may make you feel guilty at first. But a life of full-time travel can’t be lived like an endless vacation. You’ll wear yourself down to a frazzle! It can be exhausting to spend all day everyday either reading travel literature, sightseeing, or writing in your journal or on your blog about all you did and saw. There needs to be something more to life than scrambling from one tourist destination to the next. Picking up a hobby can help immensely. Our travel lives changed dramatically when we decided to learn photography and learn to write and maintain a website. These are activities that are beautifully linked to our travel adventures, but they are hobbies in their own right too. Making music, bicycling, hiking, geocaching, running, yoga, kayaking and learning to make videos are other hobbies that fit a traveling lifestyle well and will ensure you feel like you are living a life that is bigger than just being a tourist. Even after dodging that mini minefield of possible obstacles on your way to living the RV Dream, you may decide the lifestyle just isn’t for you. What then? Is the fear that this might happen enough to keep you from giving it a try? I hope not! You already know how to live a conventional life, and that life will always be available to you. There may be expenses involved in returning to it, but at least you won’t look back later and say, “I shoulda…I coulda…I woulda” Instead, you’ll say, “I did it! I lived my dream, even though it turned out not to be a dream I wanted.” More than likely, the experience will lead you to a dream you do want. The most important thing to keep in mind throughout the whole transition process is that this is just a phase of your life. It is definitely not for the rest of your life Without a doubt, your full-timing adventure will end some day, and you will probably move on to another lifestyle that doesn’t include living in an RV. So, set aside any fears you have, and live your dream. The full-time RV lifestyle may not last forever, but the memories will. The most popular full-time rigs are Class A motorhomes and fifth wheels. Class C’s, Class B’s and travel trailers are less common. However, it is possible to travel fulltime in just about anything. Some of the happiest people are those that are debt-free in a smaller rig. All that really matters when you select an RV for full-timing is that it feels like home to you. The first time we boondocked in Quartzsite Arizona, we found we were neighbors with 150 Alpine motorhomes (worth as much as $400K) on one side, and a guy living out of the back of his pickup truck on the other side. 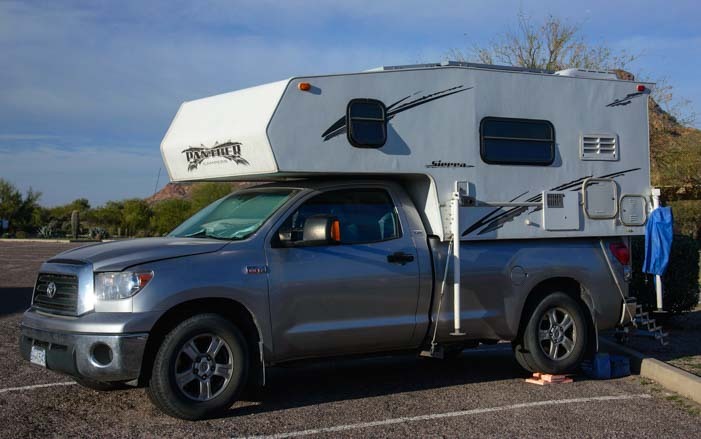 Outside of Phoenix we met a couple who were living in a tiny truck camper with no slideouts on the back of a half-ton gas pickup. They had lived in it for two years and they were loving their simple life. Do you need a huge Class A to have fun full-timing? Heck no! For two years this has been home for one couple we met. In Florida we spent some time with a couple in their sixties who had sold their house and been happily touring the country fulltime for the past four years in a popup tent trailer. The most seasoned veterans on the road have owned a variety of rigs. 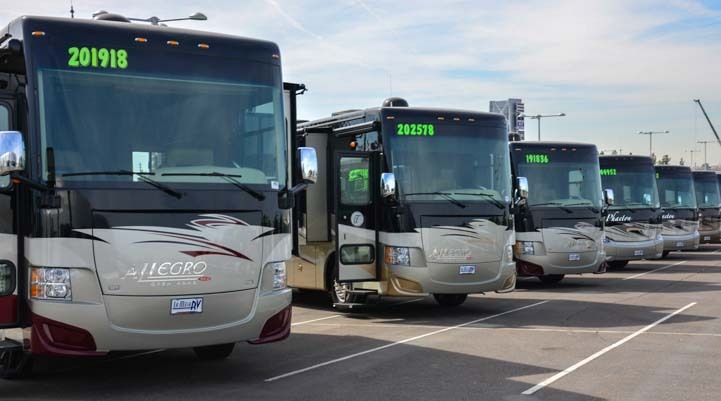 The average owner keeps an RV for just three years, and, having purchased three rigs in our first four years of RV ownership ourselves, we were ahead of the curve for a while! When you walk inside, do you smile and say, “Ahhhh…home sweet home!!” ? Both motorhomes and trailers have their pros and cons, and certainly either one makes a fantastic home. These notes are intended to give you some food for thought if you haven’t developed a preference yet. They are not meant to imply that one style of RV is superior to another. We live in a fifth wheel trailer and have always owned trailers, because we like the look and feel of them, they are simple in their design, and they are fairly easy to understand and repair. Afterall, a trailer is just a box on wheels. We tow our trailer with a big beautiful Ram dually truck. Our hitch is a B&W Companion OEM 5th Wheel Hitch that uses the new in-bed puck system from Dodge Ram (we have a pictorial installation guide for the B&W hitch here). Motorhomes are inherently more complicated than trailers because they combine the propulsion and the living quarters all in the same vehicle. Higher end Class A motorhomes also feature more complex systems in an effort to make them more like a residential house. Trailers, even high end fifth wheels, are usually outfitted with simpler systems. There’s a big beautiful world out there… Honestly, any rig will be fun! We have not lived in a motorhome, but our 44′ sailboat was very similar with a combined propulsion/house design and many of the exact same components as are found in a Class A diesel pusher. Simplicity equates to less time spent on maintenance and repair and less overall expense for everything from initial purchase to insurance and motorhome warranty, to registration to maintenance and repair. Truck campers and vans make for tight living but can be parked anywhere, from National Park campgrounds to tiny urban roads in the congested northeast. Travel trailers are cheap but can require a bigger truck than you might think to tow efficiently in the mountains (ours did). Fifth wheels are easier to back up and hitch up than travel trailers but generally require a big diesel truck. Fifth wheels are a lot taller and heavier than travel trailers (so you get fewer miles per gallon), and it’s easy to swipe everything off the roof by accident when driving under a low overhang. The comfort and view from the driver’s and passeneger’s seats in a big Class A motorhome are far better than in a truck. Tooling around town in a car and getting parked is much easier than in a big ol’ long bed truck. If you are driving a motorhome and need something in “the house,” the passenger can just walk back and get it. Sometimes the huge windshield and large interior space of a Class A motorhome can make for hot driving and you need to run the generator and house air conditioning while driving to cool it down. Gas stations are tough to maneuver in with any large RV. You can gas up a truck when it is unhitched from the trailer. Motorhomes don’t have that option but do have bigger tanks and need gas less frequently. 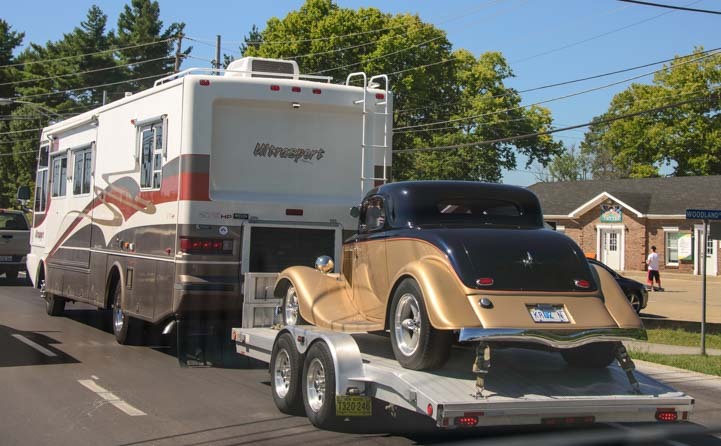 To get around town, most full-timers tow a car or “toad” behind their motorhome. Sometimes the toad becomes a handsome prince and is towed on a trailer rather than its own four wheels. Larger Motorhomes require a “toad,” or car towed behind, if you want to get around town easily. That’s two engines to maintain — motorhome and car — and the car tires wear as they are towed. Motorhomes are more more complex vehicles than fifth wheel trailers, so they take more time and expense to maintain and repair. A truck with a dead engine can stay overnight in the repair shop while you live in your healthy trailer somewhere else. A dead motorhome engine may leave you looking for a hotel room and eating out if the repair shop won’t let you stay in it there. With a truck and trailer combo, the propulsion part of it (the truck) is mass produced. There are dealerships in every town, and it fits in any repair bay at any shop, including Jiffy Lube. A truck-and-trailer combo of the same quality, size and age as a motorhome-car combo is generally about 1/2 to 2/3 of the price all together. Insurance, warranty and registration costs are less too. Truck and trailer tires are much cheaper than larger motorhome tires. Bikes can be stowed inside a large motorhome bay, or in the hatchback of a “toad” with the back seat removed, or in truck with a cap towing a travel trailer, but they mostly likely have to be left outside on a truck and fifth wheel. While at a campsite, the area under a fifth wheel can provide shade for camp chairs and protection from rain for outdoor goodies. Almost all motorhomes come with a built-in generator which means that air conditioning is available at the push of a button, something solar power can’t easily do. If you love your house but hate how it drives (or it has chronic engine/drive-train problems) or if you love the drive but the house has lost its luster, you can upgrade your truck or trailer independently of one another. If you are willing to buy used, there are a lot of great deals to be found. RVs depreciate really fast. In five years an RV will be worth 50% to 70% of what it was new. In 10 years it will be worth 40% of its purchase price or less. Negotiate hard. Mass-market brand “vacation” quality RVs often sell for 25-35% less than MSRP and higher-end “full-time” brands often sell for 20-30% less than MSRP, depending on the manufacturer. The NADA Guide gives the values of used RVs. If you are buying a trailer, look at the sticker at the hitch end of the trailer on the driver’s side. This will show when the trailer was built. If it has been on the dealer’s lot for a while, sitting in the elements (snow, rain, mud, etc.) and enduring lots of foot traffic from customers, there may be a lot of nit-picky problems when you first move in. The sticker will also give you the payload capacity of the trailer. Many “full-time” trailers are built with a payload capacity of less than 3,000 lbs. In our experience, that will not be enough in the long run. Our fifth wheel trailer has a payload capacity of 3,300 lbs and I sure wish it were closer to 5,000. Here are some thoughts on trailer cargo carrying capacity. Climb up on the roof of the unit you are buying to see what condition it is in. While you’re up there, check out the other roofs in the lot. You’ll be able to tell which units are the newest ones at the dealership by the condition of the roofs! We’ve posted a very detailed article that will give you some ideas of what to look for in a full-time fifth wheel trailer. Even if you are planning on buying a motorhome instead of a trailer, many of the same principles still apply. Check it out here! Visit lots and lots of dealerships and talk to lots and lots of salesmen. The more time you spend shopping the better purchase you will make. Besides, it’s fun! Here is a video with tips for choosing an RV dealership and an RV salesman: RV Sales Tactics – Understand What You Sign and Don’t Hesitate to Walk Away!. Who Lives the Full-time RV Lifestyle? What's the Best Way to Learn About RVing Full-time? What Does Full-time RVing Cost and How Do You Make Money On The Road? Work Camping - What Is It and How Do You Find Job Openings? This entry was posted in The Full-time RVing & Cruising Lifestyles and tagged Full-time RV Lifestyle, New, Non-Travel, Popular Articles by Roads Less Traveled. Bookmark the permalink. Definitely a great article and it is refreshing! I definitely have found that doing my RVing via vacations from work for all these years has helped me prepare for when/if I do go fulltime later in life. For sure it has helped me figure out what kind of rig I likely would want and every one of your pros and cons on that topic was spot on. I’m glad you enjoyed this, Sherry, and that you agree with my observations about different RVs. As you know, it’s fun and easy to sample the lifestyle in little bite size vacations before making the Big Commitment, and every rig has its advantages and disadvantages! Great series…No matter what type of RV anyone chooses, the important thing is to get out there and explore our beautiful country. You are absolutely right, Charles. Thank you! There is so much to see — truly something for everyone — and all that matters is that you take the time (or make the time) to get out and have some fun and do a little adventuring!! We have always been motorhome folks. But since the last rv show we started considering a 5th wheel. And now after reading your info about 5th wheel vs motorhome, we are really leaning to 5th wheel. You mentioned vacation vs fulltimer 5th wheels. What brands are considered fulltimer worthy? Im assuming much better quality, last longer, better insulation etc. It’s a really personal decision, Mark, so do lots of research, walk through tons of rigs, drive lots of trucks (see our Buying A Truck for Towing article here), and take your time with the decision. Unfortunately, when it comes to fivers, “they don’t make ’em like they used to.” If you are going used, then the best brands of yesteryear include Excel, Hitchhiker (used units are sold by the former CEO at the former factory in Chanute KS), Travel Supreme, Automate, DRV, King of the Road, and Newmar. If you are going new, then New Horizons is a good bet. DRV Suites (now owned by Thor) are beautiful, although their payload capacity is skimpy (be sure to buy upgraded tires and axles to help with that, if possible). Augusta RV, Arctic Fox and Redwood are also possibilities. If you have done your homework and are ready to specify all the details down to the nitty gritty, you can get a fabulous fully custom rig from Spacecraft (see our Spacecraft Factory Tour here). Thank you for this information. We are in our later 60’s and have a trailer and Tahoe with a lot of miles. We plan to try RVing for one month here in CA and see if we want to do it full time and buy something else. I enjoy quilting so I look forward to taking it even easier. Thank you! It’s amazing that so many people decide to travel constantly in an RV! Even if I wanted to do that, I couldn’t quite yet, since I’m decades away from retirement. However, for those that love life on the road, hopping in an RV and seeing the country is a great option. I think your advice to take time to adjust to retirement before traveling full time is sound, though. Thanks for the article! We stumbled upon your site and it’s the most informational, wonderful site out there! Thank you! We are a retired military (retired at 38) family who became empty nesters about a year ago. Though we are only in our late 40’s, thinking of working for the box we live in and seeing nothing isn’t appealing to us. Obviously 20 years of traveling with the military has given us an adventurous nature. So we are on a 2 year plan. We camp a week or two at a time now in our 5th wheel and do a lot of hiking. So my question is more on the financial side. We own a home (well … the bank owns it technically) and a rental property. We thought we had our retirement all set (in 25 more years) and all of a sudden we are ready to sell everything and hit the road to full time RVing. We figure when our daughter graduates college, settles and starts having her own children, we will think about settling again somewhere … maybe! Since we are getting a small amount of retirement from the military (surely not enough to live on for a month) what is the best planning to do financially? I would love to hear from people on the younger side (late 40’s early 50’s) who might have gone through this and what lessons they may have learned, experiences financially they went through. But if you wait until you retire … at 70 … how much living can you really do? That’s what our thought was. Irresponsible? Maybe … but tomorrow is never promised and working so hard for a box of drywall and nails, and see nothing … well, that seems sad! You are so right that it is really important to pursue your dreams while you’re young, Stacy, and how lucky you are to have had a pension for ten years already and still be under 50. Wow! So many retirees have no pension at all, even after working very hard for decades, and only military folks get to retire at 38. So, thank you very much for your service, and count yourself financially incredibly blessed. As for going full-time, go for it and don’t look back. We have a detailed article that explains our expenses in our full-time RV lifestyle here: RV Lifestyle Costs and Budget Analysis. One great option if you don’t have enough cash to live on is to work camp. We offer some thoughts about work camping in this post: Working on the Road. We started RVing full-time when I was 47 and Mark was 53. No pension. Some savings. We’ve had a blast, and most importantly, we learned how to (and are willing to) live very skinny. If you want to converse with other people in their late 40’s that are RVing full-time, You might consider joining Xscapers which is a branch of the Escapees RV Club specifically for younger working age RVers (please mention “Roads Less Traveled” if you decide to join!). Have faith in your dream and give it a try. You have absolutely nothing to lose, especially since you have a guaranteed income, no matter how small it seems, that will keep coming to you forever. How cool is that?! I’ve enjoyed reading all the different posts on this site and am looking forward to hitting the road with my wife in 18 months. I sold my business a year ago and now looking for an RV, been considering and have narrowed the list down to a class A diesel pusher and now have been trying to decide on what length. I started at a 40 but more research has brought me back to reality as people have many different ideas. We want to be able to hit all the National parks but be able to manuever around on the back roads of this great country. My current search has been looking more at 32-36 with a couple of slides. I’d love some input from you road travellers as to what we might consider and why. Thanks in advance! Thanks for reading our blog, David. This post here offers our thoughts on what we think is important when deciding which type of rig to buy. The more rigs you look at in person, the more informed you will be. Many (if not most) full-timers we know change rigs in the first 3-5 years on the road, so it’s not a permanent decision. If you’ve never owned a rig before, starting cheap and small is a good idea. For camping inside the National Parks you will probably be happiest with a motorhome that is closer to 30-32 feet. We struggled getting our 27′ travel trailer into the National Parks campgrounds, gave up on the idea, and bought a 36′ fifth wheel in our 2nd year. It is easy to see the National Parks without camping inside them. Great article on the various options available and I especially enjoyed how you recommend going small to make sure you learn about the world of RV’ing. I have a question though about your purchases. You mention that. You bought 3 in 4 years. Did you buy new and if so, how did you sell your current rig/trailer? If you buy new and decide to sell too soon, and it was financed, you could be in a bit of a financial hurt. We’ve bought all our rigs brand new for cash. If you are concerned about being upside down at trade-in time, even if it’s just a few months after purchasing, then put more money down when you buy. We bought a pop tent trailer first (info about it here). We sold it after 2 years to friends (for below market value) when we started full-timing. Our first full-time trailer was a 27′ TT (info about it here). We traded it in for our 36′ fifth wheel trailer after living in it for one year (info about the fifth wheel here). The popup was worth every penny “lost” by selling it after 2 years because it taught us almost everything we needed to know about RVing, how to dry camp, and what we wanted in a rig. We spent 157 nights in it in 2 years. I can’t state strongly enough how helpful it is to have owned and used an RV for a while before going full-time, no matter how much you “lose” by selling it later. When we started full-timing we had no idea if we would want to do it long term or not. The TT was dirt cheap even though it was brand new. When we traded it in for our fiver, we “lost” $4k on the trade-in. Again, this was an INVESTMENT in our minds and not a loss. The “cost” of starting small with a cheap TT instead of an expensive fifth wheel amounted to about $335 a month for the 12 months we owned the TT. Not bad. By the time we bought our fifth wheel, after a year of full-timing, we had visited dealerships all across the country and had been in and out of almost every fiver model on the market. We’d also visited several fifth wheel factories and seen how they were built. We knew exactly what was available nationwide as well as what the “right” price was for a given unit (it’s never MSRP, of course), things we never could have known while we were working and downsizing in our last months in our house. It is an emotional, physical and mental transition. Downsizing, living with less, or being more resourceful. Moving the RV is the most stressful part to me. I like to just be parked. It takes time to settle in and make your RV a home. There are many ways to live the RV lifestyle, and some folks prefer to stay put or travel just twice a year, one for winter and one for summer. The important thing is to remember it’s your own dreams you are fulfilling and to give yourself time and space to figure out what you love most about the lifestyle. That’s why we highly recommend buying a small and cheap RV at first and spending lots of weekends and vacations in it before jumping into living in an RV full-time. A decade ago, we rented a camper van (a small RV) in New Zealand for a couple of weeks. My husbund and I sometimes discuss that maybe someday we’ll go RVing, so enjoyable and memorable the trip was. It’s a great lifestyle living in an RV full-time, but just buying a small cheap one and going on some short adventures is a blast too. Thanks for stopping by! I agree start low price. I bought my first five in 2008 24 ft cougar dinette slide had it for 5 yrs. In the meantime I started a Rv fund looked at a lot of Rvs. In 2013 I bought a new Jayco Pinnacle 31rlts. I live in mine 7 months out off the year working on pipeline projects. I am pulling about 12 k pounds. I used to have diesel but the maintenance is not cheep. I now run gas 6.2 Ford F-350 pulls it like a dream (unbelievable) mountains will be a different story I am sure find out this next winter when I become a snowbird. I would not recommend pulling any more then 12k tops with a gas. 2 yrs and I will become a full timer keep my place in Mn for the summer months. I will probably update both then. If this helps anybody great safe travels keep it between the white lines. You’re so right, Martin, it’s really wise to start with a smaller, cheaper rig so you can figure out how to travel in an RV and even whether you like it or not. And I think you’re right about the gas engine truck being topped out around 12k lb. in tow. It sounds like you’re doing fine on the flats, but it may be a different story in the Rockies. Have fun with your new lifestyles, first snow-birding and then full-timing and thanks for your comment. It’s a beautiful life!